Mom’s visit was fantastic. She flew into Entebbe, then we spent one night at a beautiful boutique hotel before heading to my house the next day. When we arrived in my village, I was amazed by our reception – a big group of women (and a few men) singing, dancing, and drumming, and repeatedly saying how thankful they were that I brought my mother to visit them. My neighbors and a few friends also prepared a welcome dinner of traditional Ugandan foods for us. Amazing! I was so proud of my village and felt incredibly loved. While we were in my village, we actually stayed pretty busy, which is rare haha. One day for lunch we went to the house of the Epicenter Chairman (basically the community leader for The Hunger Project’s work) for lunch and were treated to an amazing spread – matooke, posho, millet, potatoes, chicken, dodo (greens), and delicious pineapple fresh from his garden. His wife even gave each of us a handmade necklace. Another evening, we walked deep into the village to see a friend’s newborn baby who they named after me (Kamusiime). Mom also brought a donated microscope with her which we presented to the community – they are really excited about the potential to have malaria and TB testing in their village very soon. Mom also came with us to one of the immunization outreaches. Every night, we watched movies curled up on my couch – felt like old times from my childhood. One of our adventures away from my site took us across the border to northwest Rwanda at the base of the Virunga volcanoes (most of which are inactive). First of all, Rwanda is so much cleaner and more organized than Uganda! The roads are paved with streetlamps and shoulders that have gravel (i.e. not muddy grossness). Every Saturday, people are required to close their shops for 2 hours and clean up their communities, so there is virtually no trash, whereas in Uganda the amount of ‘rubbish’ on the ground is disgusting. Also, the boda boda (motorcycle taxi) drivers wear helmets and safety vests, are limited to carrying one passenger (whereas in Uganda I have seen 3 adult passengers plus the driver on a motorcycle before), and they carry an extra helmet for their passenger! The president, Paul Kagame, has also outlawed plastic bags. These little differences are like night and day between Rwanda and its northern neighbor Uganda. But the main highlight of our trip to Rwanda wasn’t the cleanliness or struggling through speaking French or remembering which way to look when crossing the street (I automatically now look right before I look left, but Rwandans drive on the same side of the road as Americans) – it was seeing the mountain gorillas!!! Our adventure involved an easy hike through farmland and then through the forest as we entered Volcanoes National Park (part of an ecosystem spanning Uganda, Rwanda, and the Democratic Republic of Congo). We had heard that finding the gorillas can take hours of hiking through ankle-deep mud up steep hills and hacking through stinging nettles, but our experience was more like walking in the park on a sunny morning. After only about 45 minutes of walking, we found the Kwitonda gorilla group. 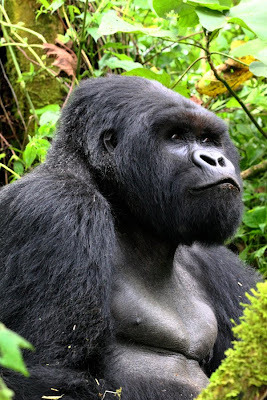 Our first sighting was a young blackback male, and it was astounding to see this massive black ape sitting only yards away from us – no fences, no barriers of any kind. During the next hour, we were continuously amazed by what was happening. 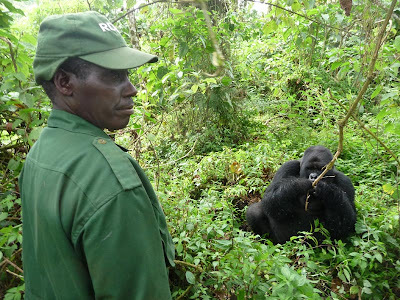 While we are supposed to maintain a 7-meter distance between us and the gorillas (mostly to prevent disease transmission between humans and gorillas), at times the gorillas walked right up to us. 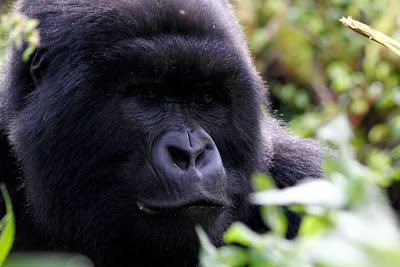 One silverback wandered right through the middle of our group – I could have literally reached out and touched him had I thought it a wise idea. 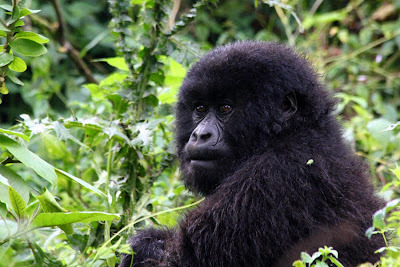 We saw three silverbacks, youngsters of all ages (including a five-month-old infant), mothers with ‘toddlers’ – all in all, the group has 21 members, the 3rd largest gorilla group in the park. The gorillas were mostly moving around and eating and, incredibly, just about completely ignored us. We were entertained by watching one youngster hang from a vine and use his/her foot to push off from a tree to spin around, presumably just for fun. Gorillas make a deep “Hmm-hmmmm” sound to mean “everything is okay”, and it was amazing to sometimes hear it coming from all around us, even from gorillas we couldn’t actually see. Just as our hour was almost up, the head silverback, Kwitonda himself, got up and walked within feet of us, all 400 or so pounds of silver and black bulk, and headed off for a new section of the forest as the rest of the group followed. The fact that they, too, were moving on made it easier to leave. I could have easily spent all day watching them, and it felt like we had just arrived when we started heading back to the trailhead. This was easily one of the most amazing animal encounters I’ve ever had. After Mom left, it was a rough transition back to site. I had been frustrated with things before she came, then everything was wonderful while she was visiting until I got a phone call from my organization on Wednesday telling me to come to a staff retreat in Kampala on Friday, my mom’s last day in Uganda, prompting a huge wave of frustration (this is the first staff meeting they’ve ever asked me to come to in the 8 months I’ve been at site) and actually made way for waves of fairly serious depression in the week or two following that. At home, I’m a normally bubbly, happy person all the time, so depression of any severity is abnormal and a bit scary for me. However, now I’m getting busier again, and I got support from Peace Corps and other volunteers on how to push through this low (and talking to them, I realize most of us are in a rough spot right now, probably the “mid-service slump” a little bit early or the 6-month-slump a little late). It’s nice to hear I’m not alone. Things have been getting back to normal now and I finally feel I’ve leveled out – part of it may be that I stopped taking mefloquine, the original malaria prophylaxis I had been on, which is known to have psychological side effects. I finally bought a guitar after talking about it for months and am starting to learn how to play – even though I’m just picking out a few notes and chords, it’s already fun and relaxing. I’ve been going on walks with Kibo through the village which are not only relaxing and fun for both of us, but also seem to be the only way her anxiety issues seem to get better. I am already researching how to bring her back to the U.S. with me – seems pretty straightforward, just need to get proof of rabies vaccination and an approved crate to ship her in. This week, I’ve been at a Peace Corps conference with many of my best friends in-country to learn about malaria as part of the new Presidential Malaria Initiative (PMI). Some of the sessions have been disappointing as they often are when led by Ugandans – not sure why I expected anything different. One of the main speakers, the director for Uganda’s national malaria control program, was not only pompous, but was giving false information, including stating that DDT not only prevents cancer, but that it didn’t kill bald eagles, the “Red Indians ate them.” He also indicated that where you take a blood sample (fingertips vs. arm) affects whether you can detect malaria parasites upon testing, which is completely false. Thankfully, most of us knew this and called his bluff, but we all were quickly fed up. Perhaps it is because this man is so prominent in the public health field in Uganda, and that I kept calling him out, that the Peace Corps community health program manager told me I should get a Ph.D. in public health and write a book, haha. Some of the other sessions were much more worthwhile, and the conference is great simply from the fact that I get to see some of my closest friends who I haven’t seen in several months, and we get hot showers, DSTV, and a swimming pool, all on American taxpayers. Thanks! We did bring up more issues of foreign aid and dependency at this workshop, though. We discussed how people given free mosquito nets (the norm from things like Global Fund and USAID) sometimes use them for things like bridal gowns or fishing nets, and the fact that the nets are procured abroad means that local businesses are severely hurt by this influx of free nets. There’s a small mosquito net factory in Kampala – how are they expected to compete in such an environment? Also, since malaria drugs at government health centers are free, people have little incentive to prevent malaria by sleeping under a mosquito net, covering their windows and vents with screens, clearing stagnant water, etc. Why make the effort to prevent malaria if treatment is free? I am now pretty much completely against any type of handout or free anything (including foreign aid in the form of grants, and possibly even loans since the debt gets forgiven) and think the future truly lies in investment and supporting local businesses. My friends and I joke that Peace Corps is actually making us more conservative (at least in the economic sense). The next couple of months are busy! In a couple of weeks, I have a training near Kampala to teach me how to train the new group coming in August, then hopefully helping with a Peace Camp in the north, teaching the new group of trainees, going to the All Volunteer Conference (every volunteer in Uganda comes together for a few days), then off to Kenya for the migration in the Masai Mara and delightful modern delights in Nairobi (including several rumored sushi restaurants!). After that, it’s only a little while until our mid-service conference at the end of October. The days here move slowly but the weeks fly by. Hi Britt :) I haven't gotten to talk to you much (at all?) in the few times I think we may have been in the same place, but I've been following your blog since before I got in country (the pictures of your house made my mom feel a lot better about what my living conditions might be like, haha). I love the pictures of the gorillas- I'm trying to convince one of my friends to come out next summer to go trekking for them. I'm attending the malaria training next week in Gulu and am so stoked to hear your take on it (hear the sarcasm?) I was just talking to women in my health center about free nets and how people might value them more if they were charged a small amount even, just because then it was something they paid for and were not just handed. They said that women cut them up and talked about how great they were for scrubbing pots, jeez. I hadn't thought about the local business impact, but that's really interesting. Hey there. I'm a PCV in the Philippines. Still addicted to Peace Corps Journals. Just stumbled on yours and it's a keeper! Looks like you have had some AMAZING adventure while doing some really great work! Keep on living the good life. Also, You read The Motorcycle Diaries. How'd it hit you. I read it once before coming here and once since. I love it every time, his observations and honest motivation to learn and experience, but I've heard from a lot of others that it's just a bland travel diary. Any strong reactions? !